I have read sooo many reviews about the MAKE UP FOR EVER Ultra HD Invisible Cover Foundation! I read that Makeup artists like to use this foundation for bridal makeup, because it would outlast even the longest day- dance, sweat and cry proof I hear! So, is it really that good? 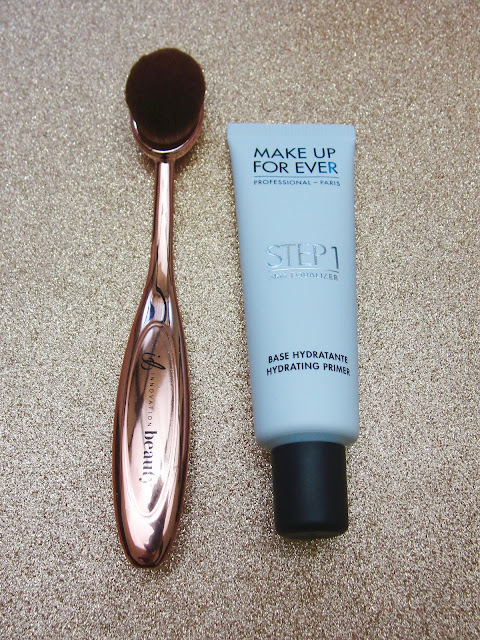 But first let´s get into the primer! Make up For Ever actually offers 11 (!!!) different primers! Holy cannoli, now that I call having a primer for EVERYONE! I have combination skin: an oily T-zone, but I am dry under my eyes. My cheeks are pretty normal. I like to use different primers for the different skin concerns I have, and so I used the Smoothing primer ($17 for 0.5 oz) on my forehead, right and left of my nose and on my chin- that is where I get during the day very oily. This smoothing primer has a thick, pasty consistency that helps instantly to improve the look of my enlarged pores- and you really don´t need much of it! I love that it is also tinted and absolutely undetectable on my skin. Now the hydrating primer ($17 for 0.5 oz) I used right under my eyes, where my skin looks crepey and dry! This is like a thin, wonderful lightweight white lotion. 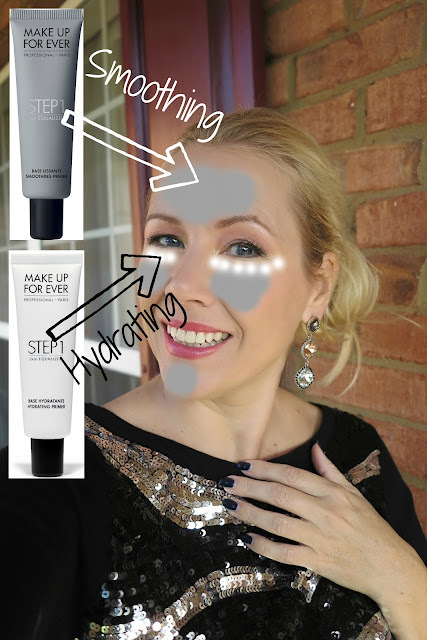 See, the grey areas are my oily areas where I used the smoothing primer- and right under my eyes I need hydration- the white areas! Anyway, now that I have primed my face and prepared perfectly for the foundation, let´s take a look at it, shall we? 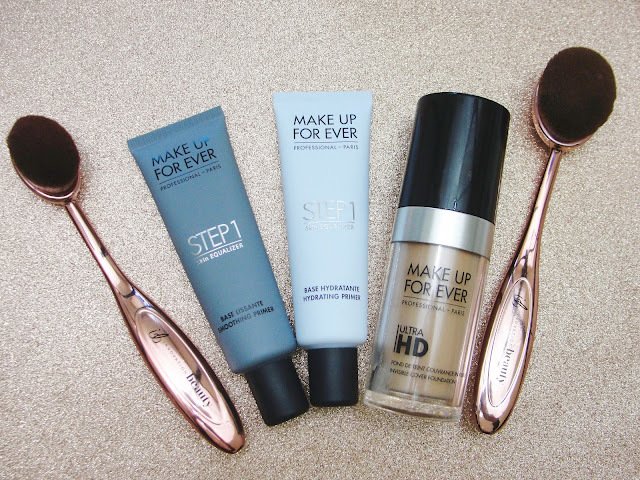 Alright, the MAKE UP FOR EVER Ultra HD Invisible Cover Foundation comes in a range of 40 (!!!) colors! WOW! I was able to pick THE PERFECT color for my skin tone! (Y355). Completely invisible under the latest, super-focused 4k lens, this revolutionary foundation features uniquely-coated pigments that provide medium to buildable coverage with an even lighter weight, second-skin texture that looks just like skin. 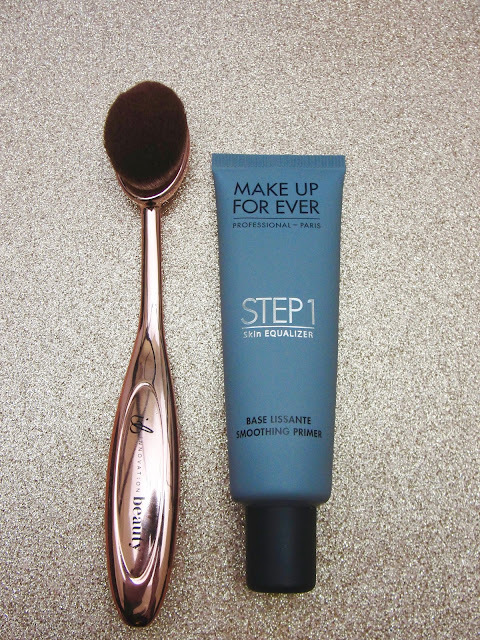 This lighter weight formula delivers the very same flawless results as before when applied with a flat foundation brush in a tap and stretch motion (see how to section). The foundation has a very thin consistency that applies so super easy and never looks streaky. I absolutely love, that it is build-able to your (or my) needs! You need a light coverage? Make up For Ever does that! You want it all covered up? Yes, it can do just that! I personally keep it with a light coverage, but build it up on areas, where I feel like I need more (my chin area has this weird red tone and needs double the product). And the product wears so well- all day! No matter how long my day was, the foundation does not break off, slip and slide of my oily zones. It stays put, until I wash it off at night. And it also does never feel heavy! I never have this feeling of wanting to immediately wash my face- you know that feel that some foundations can give you? Like you look amazing, but it just feels itchy? Not with this one! It is not only looking very natural, but also feels like it. As if I would wear nothing! I wasn´t dancing, did not marry or cry while trying this foundation- so I can´t tell you if it withstands that, but I was once at the gym with this foundation on: and although I looked shiny after wards (hey, I was lifting 20 pound weights! ): the foundation did not move around and looked still perfect! 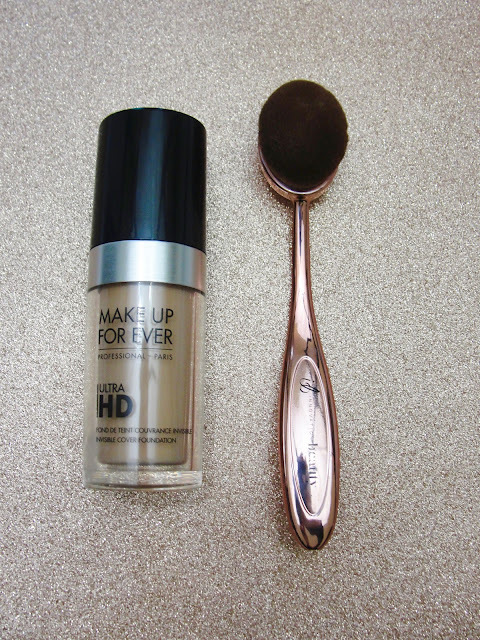 I honestly can say that I am adding MAKE UP FOR EVER Ultra HD Invisible Cover Foundation ($43) to my favorite foundations! Disclaimer: I received the products mentioned above for free. Regardless, I only recommend products or services I use personally and believe will be good for my readers. Contains Affiliate links. Read my full disclosure.